MecSoft Corporation announced the availability of RhinoCAM 2012, a major version upgrade to its current RhinoCAM 2.0 version. In addition to hundreds of enhancements and improvements to the existing RhinoCAM 2.0 product, RhinoCAM 2012 features a new 5-axis continuous milling module, powerful new toolpath generation methods along with processing and productivity improvements. 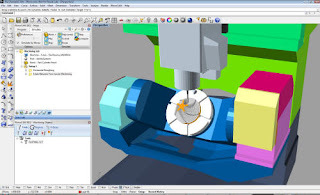 RhinoCAM 2012 also includes a parts nesting add-on module that lets users perform Rectangular as well True Shape nesting on parts to be machined. RhinoCAM 2012 runs completely integrated inside Rhino.